This is a foray into the world of Japanese university entrance exam translations (大学入試英作文), with some notes on the things I learn along the way. Without further ado, let's get started! 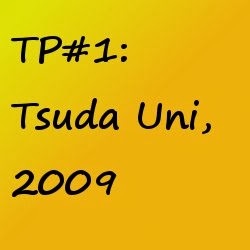 Today's source is a list of 2009 private university problems from the ticc PukiWiki. I find the whole "Japan has four seasons" appeal really distasteful. Maybe some of Japan's tropical neighbors are on a two-season pattern, but with plenty of other countries around the world experiencing four distinct ones, applauding your own country for doing the same comes across a little ignorant. But some other parts of this passage just made it too hard to pass up. Speaking of which, I learned a little while ago that the same line of thinking is also perpetually brought up in low-level language conversation with foreigners in Korea. I wonder if Japanese people ever get this line while vacationing in Seoul: "Did you know that JapanKorea has four seasons?" ...and find themselves thinking, "Wait a second. I've heard this somewhere before." I've noticed, however, that I hear this four-seasons appeal less and less as I get better at the language. Maybe it's because when I talk to new people we can actually, you know, find better stuff to discuss. 1. I started by breaking the passage down. What is the core message of the writer? In my opinion: 我が国で自然がとても美しいと感じる。 "I feel that nature is beautiful when in [Japan]." 2. The first segment is therefore merely a relative clause, an aside, that probably only deserves sandwiching between a couple of commas: "Our country, where the changing of the seasons is clearly delineated, ..."
6. In the remainder of the passage (truncated here), the writer goes on to use the phrase ではないだろうか, which to me makes this a personal opinion piece; first-person seems appropriate.